Home » Appliances » In The Kitchen » GE Profile Series 2.2 Countertop Microwave Review — Is it Worth the Buy? 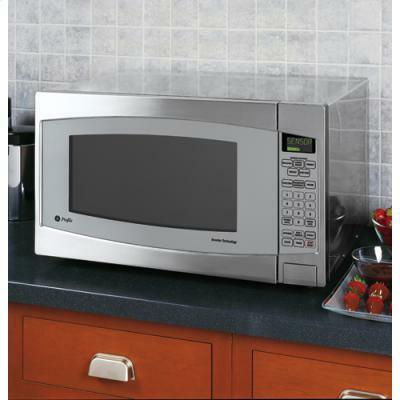 The GE Profile Series 2.2 Microwave is designed in stainless steel and features a sensor reheating button. This “high end” microwave is supposed to make your cooking and heating process as simple as possible. Yet, even though GE positions their microwave as a high end device, actual cooking might not be as simple as they describe. Of course, a lot will depend on the dish. Several tests have been run, and the results appeared to be surprisingly diverse. So far, macaroni and cheese is the only dish that was easy to cook. The result was really great – creamy and soft. However, when it comes to dishes as tough as lasagna, the result is rather disappointing – some of the layers were obviously undercooked. The same goes for popcorn and potatoes. On the first attempt, half of the popcorn seeds remained unpopped. This, however, is a common problem for the majority of microwaves – so there is noting surprising about that. Baking potatoes is also tougher than it seems – whatever you do, some of them still remain undercooked. However, when it comes to reheating food, the results are simply astonishing. The sensor button merits the amount of steam, which makes it possible to easily reheat your leftover dishes. The design is not that different from an average microwave oven. It features the same classic look, and the only thing that makes a difference is a stylish sensor button. Even though it looks really great and manages to create a feeling of lightness, the microwave still remains rather bulky. The dimensions are 20x24x14 inches, so if you try to use your kitchen space efficiently, GE Profile series microwave might not be the best option for you. However, its stainless steel design still looks richer than the traditional black and white ABS microwave ovens. On the other hand, the microwave is rather pricy. 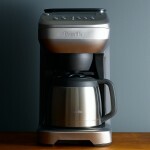 At 359$, one should expect something more than a button-styled, stainless steel design. Especially given that the functionality is not that different from other, less expensive microwave models. As it was already mentioned, it still has limiting cooking capabilities, so $359 might be too much for a mere reheating appliance. All in all, it is possible to find cheaper models with similar functionality. Yet, if you need an appliance that looks stylish and can reheat your leftover food at the first attempt, GE Profile Series microwave might be a sound investment.